Examples, solutions, videos, worksheets, and activities to help Geometry students. The following diagram gives some examples of corresponding angles. Scroll down the page for more examples and solutions. Adjacent angles share a side and a vertex. If angles only share a side but not a vertex, they are not adjacent. Adjacent angles can also be described as "next to" or "side-by-side" angles. How to define adjacent angles and define a linear pair. Vertical angles always come in pairs. They share a common vertex but they cannot share a side. Vertical angles are congruent, which means they have equal measures. How to define and identify vertical angles. How to find a missing vertical angle in a triangle? 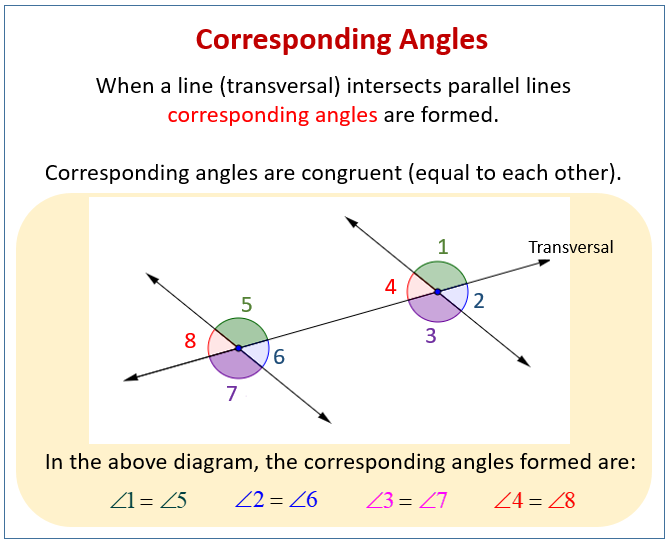 Corresponding angles can apply to either two polygons or parallel lines cut by a transversal. In both cases, corresponding angles are in the same position. If the two polygons are congruent, then the corresponding angles are also congruent. If the two lines are parallel, then the corresponding angles created by the transversal are congruent. How to define corresponding angles and their special properties.